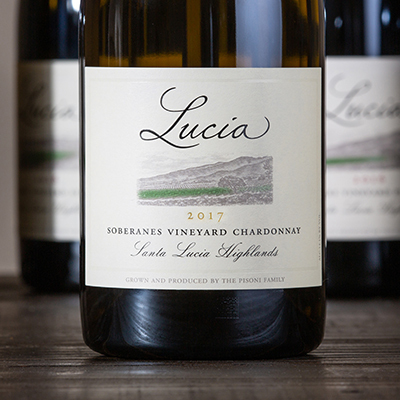 Shimmering with a youthful brilliance in the glass, the 2017 Lucia Soberanes Vineyard Chardonnay offers a lifted aromatics of lemon oil, orange blossom, and green apple on the finish. A product of the dense, rocky soils of this site, the wine is flinty and mineral-driven to its core. Its focused acidity bursts with energy as it dances on the palate. Each windswept grape cluster delivers immense concentration that is carefully extracted through gentle pressing. Minimal stirring of the lees over the course of a 15-month slumber in the cellar provides this chardonnay with a focused intensity. In the glass, this wine comes to life with a flawless balance of fruit, density and length, all of which combine to produce a delicate tension that will reward for many years to come.